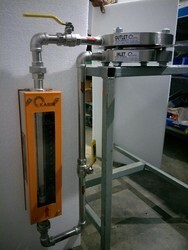 Bypass Rotameter systems are designed for the accurate measurement of fluid rate of flow in pipelines 25 NB in diameter. They accomplished this by providing a bypass flow that is directly proportional to the main flow. Since Rota meter measure bypass flow, not static differential, flow ranges up to 10 to l are possible with these instruments. Looking for Bypass Rotameter ?